If you're here for the A-Z Reflections Post, it's at the bottom of this post. Penelope snuggled up with Sabbath in her warm, cozy bed. She listened to her cat purr as she stared at the picture of St. Michael. The picture which she’d looked at almost every night since her childhood now held new meaning. Now she looked at her destiny and not just St. Michael. But her great-grandmother’s words, “Perhaps the prophecy was misinterpreted,” didn’t soothe the nagging in the back of her mind. Why didn’t Michael’s eyes match hers? She heard the wind howling outside of her window. Another demon? No, this wind sounded peaceful, not like the eerie wind which had preceded the appearance of demons. The tap at her window startled her at first, but when she saw Michael’s handsome face at her window, she smiled. As she rose from her bed and traversed the hardwood floor to the window, the sight of Michael’s flapping wings thrilled her. He landed on the small balcony of the second floor veranda outside of her window. The sight of his sculpted bare chest and enormous wingspan took her breath away. She opened her floor-to-ceiling window and walked out onto the balcony. He extended his hand towards hers and looked deep into her eyes. “Fly with me, Penelope,” he said, not asked. She walked towards him fearlessly, and extended her hand to his. “I’ll never let go,” she whispered. She embraced him, letting the warmth of his bare skin penetrate through her silken nightgown. Michael flapped his wings and they slowly rose above the ground. He ducked his head under the roofline of the veranda and led them out into the open sky. Penelope looked up at the stars above. Euphoria swept through her heart, through her soul. Thoughts of Michael’s eyes vanished and Penelope knew she belonged with him - her angel, her destiny. She nodded her head. “This is wonderful.” She looked up at him and nuzzled her cheek against his chest. “I thought you’d like it.” He smiled down at her. She peered down below, breathless at the sight of the Garden District beneath them. The mansions appeared smaller and smaller as Penelope and Michael ascended the night sky. “Where are we going?” she asked. She looked up at Michael and watched him smile at her obvious puzzled expression. “We’re about to fly really fast, so hold on tight,” he warned. She happily obliged and squeezed her arms around his neck. She hooked her bare ankles around his calf muscles and kicked herself for not putting on shoes before she flew with him. Michael tightened his embrace and hummed. 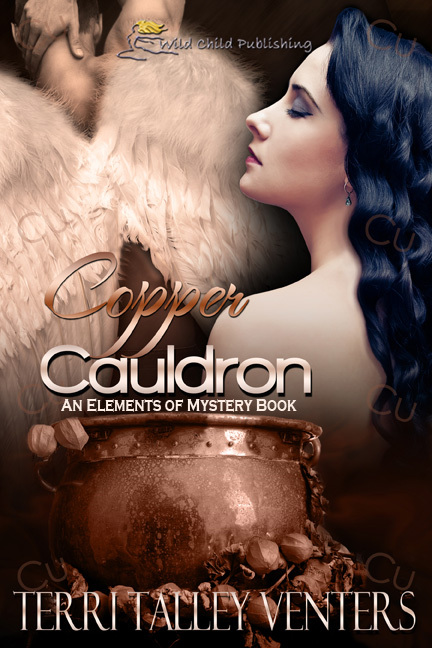 Latin words poured out of his mouth as his wings flapped faster and faster. He’s singing, and his voice sounds angelic. Penelope heard other voices singing too. It sounded as if all the angels in heaven sang with him. Michael’s wings flapped faster and faster as the music grew louder and louder. She felt the wind blowing stronger as their speed quickened. She hugged him as tightly as possible and closed her eyes. The voices stopped and their air speed slowed. “You can open your eyes now. We’re almost there.” Michael pointed down. Penelope opened her eyes at the beautiful sight before her. They flew towards Capri. She’d been to the small island just off of Italy’s Amalfi coast. The island illuminated beneath the full moon of late-night sky. With the six-hour time difference, and assuming nearly instantaneous travel, she calculated the 4 a.m. time. “Do you recognize where we are?” Michael’s lips whispered the words in her ear. “How did you…?” Puzzled, she looked up at his face. 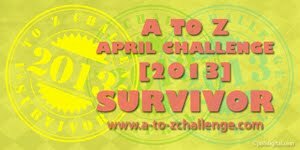 I really do love the A-Z Challenge, but I'm also really glad we're in May now. Writing with a theme. The writing and pre-scheduling of the posts are perhaps the easiest part of the entire challenge. The addition of categories to add beside our blogs on the link list. It was nice to know what type of blog a person was clicking on. That was a big plus. What posts I managed to read and everyone who stopped by and commented were awesome! Time. I didn't have enough of it. Between writing 30,000 words for Camp NaNoWriMo, finishing up a short story for Men of Foxwick, then getting sick with bronchitis, all my hopping around, following, and commenting back time vanished. I'd hoped the last two days I would be able to get back to the blogfest, but then my mom got sick and was in the hospital from Saturday evening to Tuesday morning. She's better now, but I guess by April 29, I wasn't really feeling like doing anything. Then I got this massive day job work project, so it's sucking away even more time. And that's it. Beyond not having as much time as I thought I would, I thought the challenge went well. I don't think I would change anything about it, although next year I hope to have more time. Also, I participated with two blogs this year, and I think next year I'll just do one. Perhaps I could alternate between blogs. I haven't completely decided, but I do hope to participate next year. I will also be getting to those people who commented on my blog. Your comments meant the world to me, and I loved your enthusiasm for Foxwick. I have all the emails for the comments in my Inbox, so I will be following and visiting. It just might take me a few weeks to catch up. A special thank you to the A-Z hosts and their lovely minions! You guys make the A to Z Challenge run smoothly. You're the best! I'm sorry your mom was in the hospital. Glad she's doing better. I didn't have the time to visit many new blogs either. Glad she's doing better and I agree time was a down side. Great excerpt! The cover looks amazing. Summer, Glad you love the cover and excerpt! I'm planning to make this a series. Thanks for stopping by. Glad you and your mom are feeling better. The series sounds interesting. I'll have to check it out. Glad you liked the challenge. Hope your mom is feeling better. As a non participant reading blog posts, it took a lot of time so I can relate. I'm looking forward to a quieter May. I enjoyed finding out more about Foxwick and sorry I didn't get to more posts. You've had a rough time, hope you and your mum are both better now. Congrats on getting to the end! I hope your bronchitis is better and your mom. Stuff seems to have been going around lately. My parents were both in the hospital... that may have been April. I lose track of time. Even with writing my posts ahead, time always felt short for me too. I still managed to visit a lot and had fun. Congrats on your posts. They were fun. Time was an issue with me too. I had hoped to visit more new blogs, but maybe I'll do that over the summer. Glad your mom is doing better. Great excerpt Cherie. Great to hear you mom is doing better! Best wishes to Terri and her success! And time is of course the most challenging thing about A to Z. But having a theme does help! I really need to check out the Elements of Mystery series sometime. It sounds amazing! And wow, you weren't kidding about not having time in April. Can't imagine how scary it must've been to have your mom in the hospital--glad to hear she's feeling better now! Thank you everyone for your kind words. And thanks Cherie for hosting me again =) Hope everyone enjoys my stories! Have a great weekend all!